Students speaking out in their own words. Creating space for authentic youth voice and participation. Creating momentum to create positive change in California schools. #Barriers2U is a youth driven campaign to highlight the challenges students face on a daily basis in California schools. It creates the space for young people to use their voice so that adults in power can begin to understand what the experiences of young people in school look and feel like. Despite the national focus on improving schools, most “educational fixes” are made without talking directly to those living, and at times just surviving, in schools everyday–students. Schools are not only places where young people learn, they are also places where young people are affirmed, welcomed, shunned or ostracized. If schools are not safe, how can young people learn? If young people are not supported how can they succeed? By speaking out, students hope others will identify with their struggles and begin to voice their own barriers so that collectively we can find solutions. The goal of the campaign is that administrators, educators, policymakers and any other adults who see the video will be compelled to work with youth to eliminate the barriers, and begin to understand what these young people really need in order to learn, succeed and thrive.#EliminatetheBarriers. Read more or contribute your ideas and voice to the #Barriers2U Blog. To submit a piece or to tell us how you overcame your barriers to learning, email info@aesimpact.org. #Barriers2U is part of a regional strategy to ensure that young people are actively engaged in working with adults to develop the solutions to educational challenges. 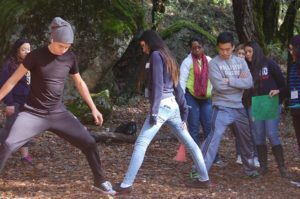 A joint project of the CSU, Chico Cross Cultural Leadership Center (CCLC) and AES, it began at the 2014 summer youth empowerment and advocacy retreat facilitated by the CCLC. During the retreat students were asked: What are the barriers that keep you from being successful in high school and going to college? Each student had a story, each story had a struggle the student was not able to overcome. These stories were distilled into one word phrases that the students felt best represented their barrier. The results are the #Barriers2U testimonials. The campaign was the idea of CCLC paraprofessionals and college students, many of whom overcame their own barriers to attend college, to bring awareness to the barriers keeping high school students from being successful in their journey to higher education. Create your own Barriers2U message: Post it on You Tube with the title “#2Barriers2U”, then post it to our Facebook page and yours. We’ll share it on Twitter, Tumblr and Instagram – as can you! Tell us How You Can Eliminate the Barriers: Create a message with the title #EliminatetheBarriers and post it to our Facebook page and yours. We’ll share it on Twitter, Tumblr and Instagram as can you.